to our existing vhost. For nginx < 0.8.21 we must add the word default to the listen directives whenever you specify additional options like ssl or ipv6only=on. The word default can be used only in one vhost, so when you create further SSL vhosts, you must leave it out and therefore also the additional options (as I understand it, they will be inherited from the vhost that uses the word default). so that the right rewrite is done depending on the scheme you use (http or https). I have left the http vhost untouched and added an SSL vhost with the same configuration, except for the SSL part. Instead of adding ssl to the listen line, I use ssl on; here. For nginx < 0.8.21, I have to use listen [::]:443 default ipv6only=on; instead of listen [::]:443 ipv6only=on;. Instead of using ssl on;, I add the word ssl to the listen lines. Because of this option in the listen lines, you must add the word default for nginx < 0.8.21. To request a trusted certificate from a trusted CA such as Verisign, Thawte or Comodo, we must generate a certificate signing request (CSR) from our private key and send it to the CA which then creates a trusted certificate from it with which we replace our self-signed certificate. You will be asked a few questions. Please fill in your details, they will be used for creating the trusted certificate and can be seen by your visitors when they choose to view the details of your certificate in their browsers. The most important thing is the Common Name - this must be the domain or hostname of your SSL vhost (www.hostmauritius.com in this case)! To get a trusted certificate, you have to take your certificate signing request (CSR) to a certificate authority (CA) such as Verisign, Thawte, or Comodo (please note that you have to pay for a trusted certificate). 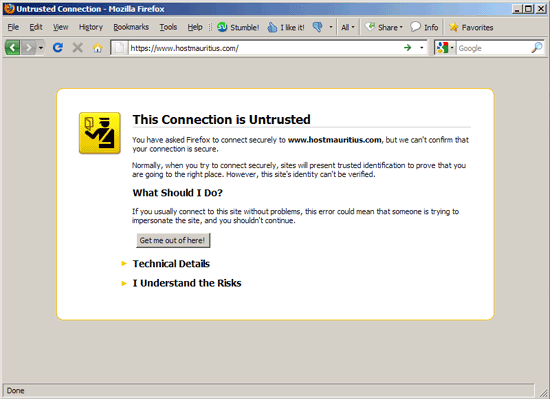 Certificates issued by such a CA are trusted by all browsers which means you won't see any browser warnings anymore. CAcert.org allows you to get free certificates, but the downside is that such certificates are trusted by only a few browsers (which means you will get browser warnings). 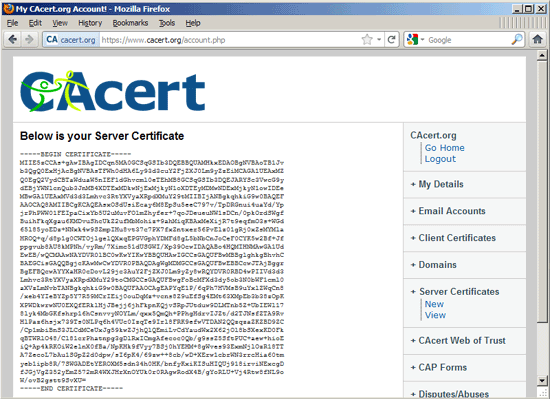 Anyway, I will use CAcert.org here to show you how to get a certificate from a CA - it should give you the idea, the procedure is the same with the trusted CAs. 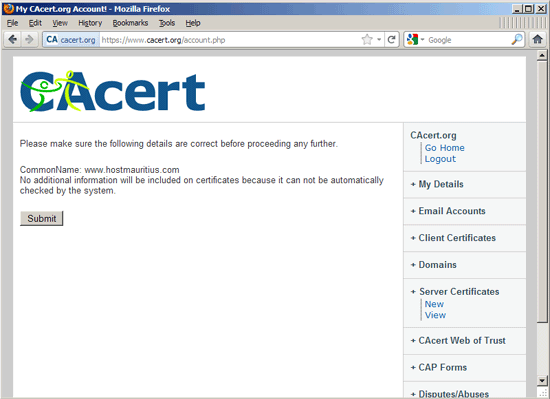 That's it, if your CA doesn't ask you to install a certificate chain file or intermediate certificate in nginx, you're done, and you can now access your SSL vhost (https://www.hostmauritius.com in this case) without a browser warning. 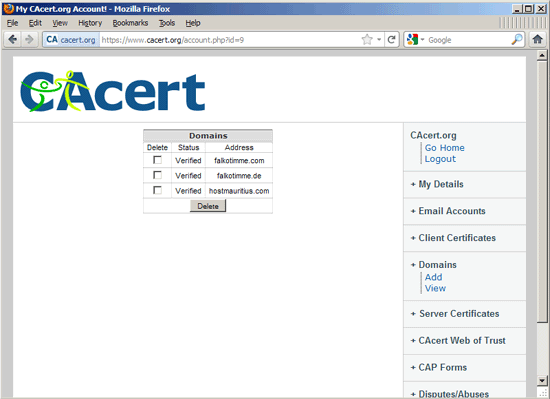 (If you use a CAcert.org certificate, you will still see a browser warning as most browsers don't know this CA - read chapter 8 to learn how to make your browser trust CAcert.org certificates). Some CAs require that you install a certificate chain file or intermediate certificate in nginx (in addition to the certificate that you installed in chapter 7). 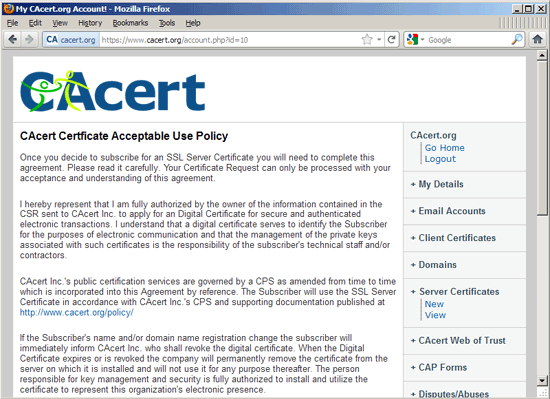 (Please note that CAcert.org does not require this!). I am trying to use nginx with ssl library . I have installed nginx 1.2.1 and run the basic nginx localhost command .I have also successfully displayed fcgi file on my localhost/echo.fcgi and it work fine. 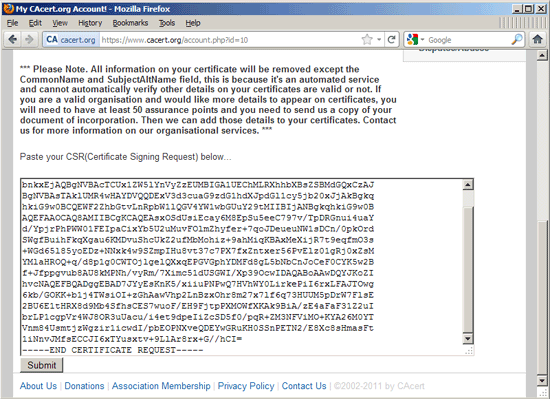 Now I am trying to configure ssl certificate with nginx. Restarting nginx: nginx: [emerg] SSL_CTX_use_certificate_chain_file("/etc/ssl/certs/www.hostmasite.com.pem") failed (SSL: error:02001002:system library:fopen:No such file or directory error:20074002:BIO routines:FILE_CTRL:system lib error:140DC002:SSL routines:SSL_CTX_use_certificate_chain_file:system lib) nginx: configuration file /etc/nginx/nginx.conf test failed how can i resolve this ?